Staples No. 1 singles player Alyssa DiMaio serves during the Class L girls tennis finals on June 1, 2018 at Yale University in New Haven, Conn. No. 4 Staples defeated No. 3 Darien 4-3. NEW HAVEN—With all seven matches of the girls Class L tennis finals happening simultaneously on the courts at Yale University, the crowd was spread out, creating a mostly docile environment. Three hours later however, with Staples and Darien tied at three, everyone in attendance was perched above the No. 2 singles match. What they saw was No. 4 Staples’ Olivia Foster edge out No. 3 Darien’s Emilia Callery 7-5, 0-6, 6-4 to win the Class L title 4-3 Friday afternoon. The win was Staples’ second title in three years as the Wreckers have advanced to the finals in the past four seasons. It also marked the first time in program history that Staples has won both the FCIAC and state titles in the same season, after defeating Darien by the same 4-3 score in the conference finals last week. While Foster and Callery were battling two courts away, it was the No. 4 singles match that had half of the viewers’ attention. With Daren trailing 3-2 at the time, Katie Wiley was vying to stave off a late run from Staples’ Alisyn Kercher in order to tie the match and give her team a chance to win. Like Foster, the added intensity of playing in front of a growing crowd aided the freshman’s performance. Alyssa DiMaio, Staples. The No. 1 player, whom Fabian called one of the best ever to play at Staples, had what he described as one of the biggest wins in program history, defeating lifelong rival Lilly Ma 6-1, 6-0. Singles: Alyssa DiMaio (S) def. Lilly Ma 6-1, 6-0; Olivia Foster (S) def. Emilia Callery 7-5, 0-6, 6-4; Emily Wiley (D) def. 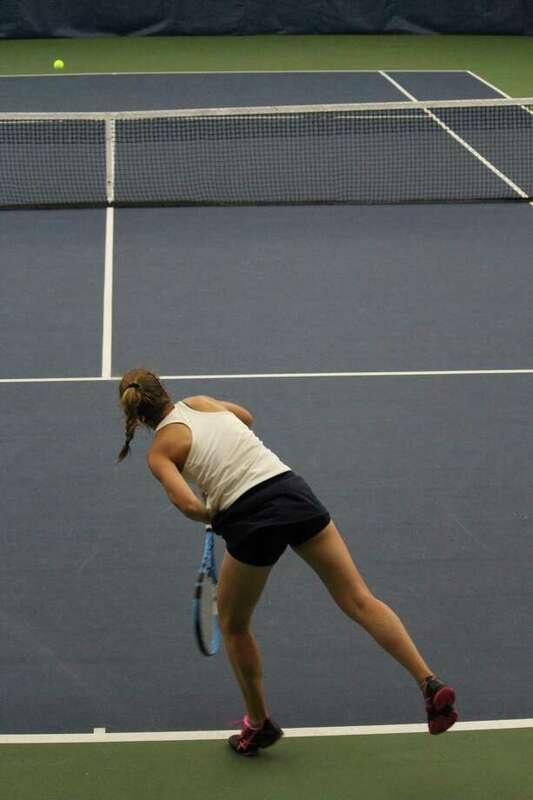 Carine Geijerstam 6-2, 6-3; Katie Wiley (D) def. Alisyn Kercher 5-7, 6-3, 6-3. Doubles: Kristin Butler/Hannah Bjorkman (S) def. Emily Neuner/Juliet Homes 7-5, 6-3; Elaina Cummiskey/Quin Wolters (D) def. Gabriela Vega/Olivia Gordy 2-6, 6-2, 6-4; Lily Smith/Natalie Carozza (S) def. Caroline Homes/Daniela Castellanos 6-0, 7-5.